In 2009, Dan Deacon released Bromst, an album notable for its dense wall-of-sound production, broad tempo changes, and oddball chord progressions. Now, three years later, many of those elements have once again been revived in Deacon’s latest effort, America. However, Deacon has also added quite a few new ideas to his music -- most notably a variety of orchestral instruments and a markedly higher level of maturity. While Bromst was the effervescent soundtrack to a celebration, America seems to be a much more introspective and grandiose effort. The A-side of this record touches closer to Deacon’s signature experimental EDM material. While a few of these songs may not be as accessible as some of his previous efforts on Spiderman Of The Rings or Bromst, there is definitely enough entrancing rhythm and bombastic swells to satisfy any rave-dancing Deacon fan. Guildford Avenue Bridge and Lots provide plenty of blustering tribal drum beats and distorted synthesizer flourishes to keep this side of the album dance-friendly. However, both tracks still remain incredibly experimental with the inclusion of odd acoustic sounds, Asian string samples, and multiple layers of found-sound. True Thrush is definitely a stand out from this set. Deacon has one of his most audible and emotional vocal deliveries on this track -- one that conveys both frantic disillusionment and euphoric surrender. These vocals are supplemented by a floating ethereal harmony that occasionally wisps in to break up “the beast” on Deacon’s brain. Pretty Boy is another one of the album’s more affecting pieces. The track features a gorgeous arrangement of angelic synthesizers, cascading piano chords, solemn violins, and wandering bassoon melodies that coalesce into a cacophony of sublime textural sound which suddenly evaporates around the five-minute mark. 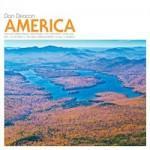 As enjoyable as the first half of America is, the sprawling suite on the flip-side is a truly inspired effort from Deacon -- probably his most adventurous and involving piece to date. The composition ambitiously integrates both electronic synthesizer sounds with the acoustic character of orchestral instrumentation to produce a tone-poem representing the vast and ever-changing landscape of America. However, what’s more interesting about this concept is the treatment of the orchestra. Deacon composes a score with all of the characteristics of computer music -- pulsing rhythms, randomized arpeggio melodies, and shifting dynamics -- but applies it to the orchestra. While these elements would seem to complicate and polarize the sound of the ensemble, they actually come together in probably the most inventive blend of texture, timbre, and polyphony I’ve ever heard on record. In all fairness, America is a really tough album to wrap your head around. It’s heavily layered, noisy, and at times downright chaotic. However, those trying moments of mayhem and drone are always followed up by a contrasting moment of pure beauty -- much like the shifting landscape of America. America takes you on a long journey across busy city streets and somber countryside and while this expedition may be absolutely overwhelming at times, it’s ultimately much worth the trip.